London is not a city built for snow. Those who were here during the winter of 2010 may remember the 12 inches of the stuff which fell in the space of one eventful December afternoon. That day the city ground to a cold, damp, although admittedly aesthetically appealing, halt. That was also the day my business partner Tom and I were fitting desks in our first office. That office would later become home to Animade. But at the time, I had more pressing concerns. Trying to get a sheet of plywood through a door and up some stairs in a blizzard is not an experience I would recommend. Overall though, it was a hugely exciting time. Work was coming in, and we were saying yes to everything. Because that’s what you do when you’re starting out. Just say yes, and find a way. We didn’t see losing a couple of days to desk-building as a problem - we’d just make up the time somewhere else. Weekends, evenings, whenever. But, of course, you can’t keep saying yes indefinitely. Eventually, we spread ourselves too thinly, for too long. As the only people at the company, we were doing everything. Desk building, project management, bookkeeping, and of course the creative work we were hired for. Soon enough, the cracks started to show. Deadlines were missed, grovelling apologies were made. The work began to suffer, and we had to act. If we wanted to take on more work, we needed to bring on more staff. We had no business or management training. Where to start? There are a lot of pitfalls involved in bringing people into a business you’ve started yourself. However, with a bit of effort in the right places, the process can be much, much simpler than we made it. One way of solidifying your goals if you’re growing a business is to consider the size and makeup you’d like your company to have for it to be “done”. How many people will work there? What job titles will they have? 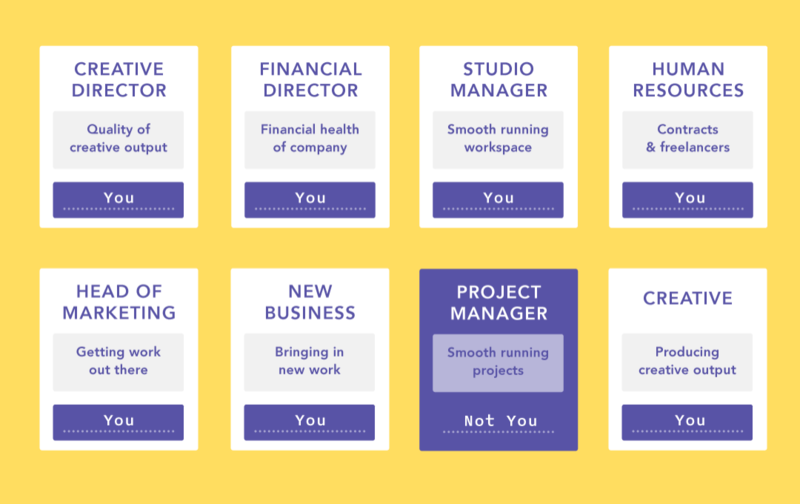 List out who will work in the dream version of your company, together with a summary of what they’re accountable for. Underneath that, write who is currently responsible for each role. It might seem silly to do this if you’re a one-person outfit, but being honest about the work on your plate is incredibly valuable for your own sanity as much as anything else. There’s so much which goes into running a company, but a lot of it can go assumed or unsaid. Getting a picture of everything which needs to happen to get a business to function is a vital step. 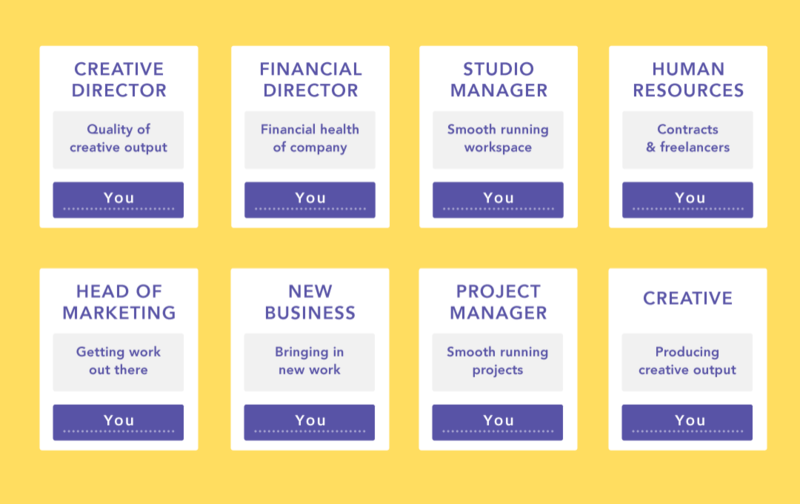 With your ideal company structure in hand, you’ll have a map of the road ahead. For the sake of argument, let’s say you bring on some part-time project management help. Wonderful! But there’s a problem. How will the person you bring in know how you’d like things to run in a way that’s unique to you? For a long time, we were keeping the knowledge of how our company ran (or how we wanted it to) in own heads. If it wasn’t in our brains, it was on post-its, in random text files, or scrawled on the back of beer mats. It’s not easy for someone new to take that information and run with it. The key to being in a position to bring on help is to write down how to do things. It sounds simple, and it is. The discipline is in making it a habit and keeping that information up to date (that’s the “pain” part). These are your Playbooks. They outline how your company works in the way that you want it. How you do things. In detail. For example, sharing images on social media involves exporting files at various resolutions and sizes. Sure, you can Google these each time you want to post work online. But if you want someone else to help you, you’ve got to rely on them to search for that information each time. Putting that information in a Playbook means there’s one place to look, and a clear, repeatable process, regardless of who is doing it. 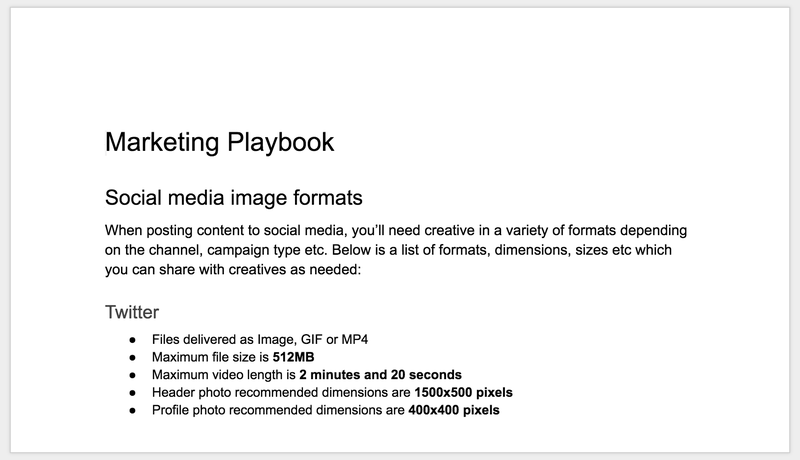 To give a sense of how we approach Playbooks I’ve collected together a couple of sections from the Marketing Playbook we use at Animade. Of course, this barely scratches the surface of everything the role entails. Nonetheless, it will give you an idea of how we like to document things. Generally speaking, the content of a given Playbook isn’t groundbreaking, and this sample is no exception. But the benefits of having a centralised place for practical things like this are immense. Sometimes half the battle with small admin tasks can be remembering where you bookmarked the information you need. Playbooks take that mental fuzz totally out of the equation. We have a Google Doc Playbook for each role, but starting off with one for everything will work well as a first step. We’ve found Google Docs to be perfect because everyone knows how they work, they’re collaborative, and it’s super easy to paste screenshots in. Even if you never plan to hire people or grow beyond a one-person outfit, I believe this is a robust approach to running a creative company. Acknowledging everything that goes into keeping a business running is crucial, regardless of your goals. If you’re interested in learning more, I’d highly recommend taking a look at The E-Myth Revisited. It changed the way I thought about running a company. We’d love to hear any questions or thoughts you may have - just let us know in the comments.